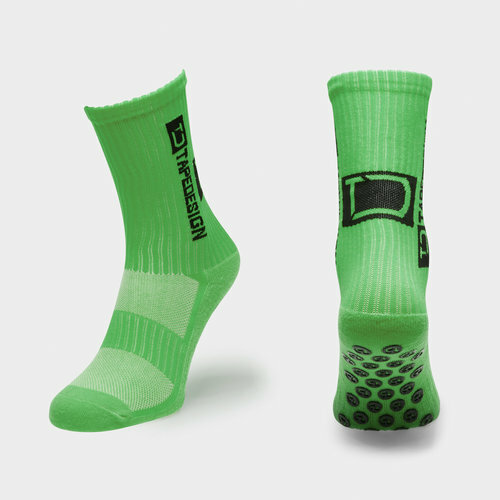 Stay one step ahead of the game when you slide on these TapeDesign Allround Classic Anti-Slip Sports Socks in Green. These special all round socks provide more grip and a better feel no matter what trainer or boot you're wearing. Due to the special material composition, the socks are very comfortable and extremely elastic at the same time – so you can adapt to every foot ergonomically. These socks are sure to impress with their functionality and innovation. There are specially placed rubber knobs on the outsole in an ergonomic foot shape to create that perfect fit in any shoe. The ideal garment to be worn in all sports where direction changes and rotational movements are necessary.